Chutter bhoj temple at Orcha, near Jhansi. bl.uk > Online Gallery Home	> Online exhibitions	> Asia, Pacific and Africa Collections	> Chutter bhoj temple at Orcha, near Jhansi. 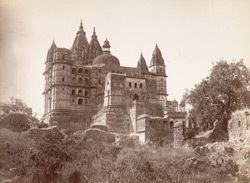 Photograph of the Chaturbhuj temple at Orccha in Madhya Pradesh, taken by Deen Dayal in the 1880s, part of the Bellew Collection of Architectural Views. The little ghost town of Orccha, once the capital of the Bundellas,chieftains of Bundelkhand, is very near the city of Jhansi in central India. Sited near a village of the same name, Orccha is famed for its remnants of medieval architecture, including fine forts, palaces and temples, blending Indo-Islamic styles. The medieval city was founded in the jungle along the Betwa river in the 16th century by the Bundella chief Rudra Pratap. The most famous of the Bundella rulers was Bir Singh Deo (ruled 1605-27), ally to the Mughal prince Salim who was to become Emperor Jahangir, and slayer of one of Salim's father Akbar's favourite courtiers, the historiographer Abu'l Fazl (d.1601). Bir Singh Deo was a keen builder and attributed to him are many of Orccha's finest structures. The Chaturbhuj temple with its soaring spires or shikaras was built by a Queen of Orccha in Akbar's time (late 16th century). In the 18th century, the mighty Marathas of western India gradually took power over most of the region of Bundelkhand, and in the 1780s, the ruler at Orccha shifted his seat to Tikamgarh, after which Orccha remained largely deserted.